This is one of my favorite road-trip photos. 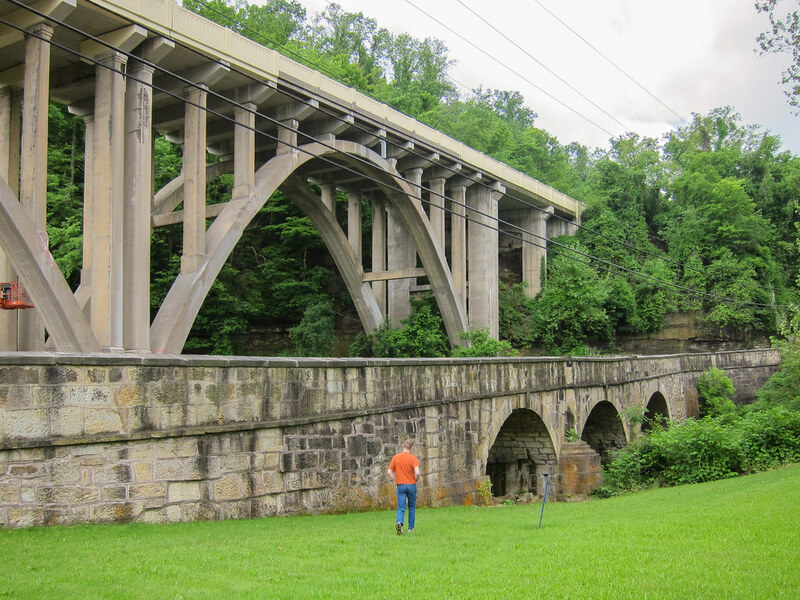 I just love the juxtaposition of the 1828 stone-arch S bridge against the 1933 open-spandrel concrete-arch bridge. Both are engineering and visual marvels in their own ways. But what I love most about this photo is that my friend Jeff, in his orange shirt, cuts across the scene. He provides such visual interest, injecting orange and blue into an otherwise beige and green scene. He also shows the massive scale of these two bridges. The newer bridge runs so much higher than the older one because it means to level out what had been a steep hill. The ascent from the end of the older bridge was quite challenging for cars of the day. Nice, that’s so green you’d think it’s England. Southeastern Ohio is this lush everywhere! Does the lower bridge ever have a problem at flood stage? I don’t know, but I have to assume that it’s been underwater at times.